Four-and-a-bit hours south, and we hit the coastal city of Mackay, home to over 70,000 people and the very hospitable brothers and sisters of Mackay Presbyterian Church.After speaking at the morning service at North Mackay, we headed to the Northern Beaches, and established some good connections in both congregations. Through the week, Elspeth shared with a group of Northern Beaches ladies, and Keith joined some of the men for a bible study. We’ve been fed, licked (not sure if we were puppy-sitting or the other way around), and prayed for. A highlight was meeting some folks at a PresCare morning tea, and enjoying a few hands of euchre (a card game combining skill with a degree of bravado). It would be great to be that lively at 70 plus! ople. We don’t want the six week tour to be totally focussed on us, but hope to develop relationships and to be able to pray for folk in a meaningful way. Pray for the Northern Beaches church plant, that they would continue to reach into the community with the gospel. Mackay has been impacted by the economic slowdown in the mining sector, and this is felt in the city generally, and in the church community. Pray that God may sustain folk through uncertain times. Next stop… Rockhampton & Yeppoon. Keep praying that God leads us into conversations and relationships to His glory. In a few days time, we head off on our six week “church crawl”, seeking partnership with congregations and individuals along the journey. With 1800 kilometres of driving, and ten congregations in the schedule, we expect to be kept occupied. It won’t be all work and no play – there is some amazing countryside along the way. We hope to be blogging each week up to Christmas, so keep checking for photos. We’ll soon see if the ‘smart phone’ lives up to its title. Expect snaps of church groups, generous hosts, lots of trees, and some relaxing campsites. Safety… we take nothing for granted when travelling. Between the road surfaces, other drivers, and the odd kangaroo, there are plenty of potential hazards. Stamina, physically and spiritually… we have planned to spend up to a week at each stop, but it is still a lengthy journey. Time away from routine can be a challenge. Pray that we be ready to serve each congregation in whatever way God leads. Prepared hearts… that God will lead us to connections with folk who will take us into their hearts, their homes, and commit to partnering with us in His service. 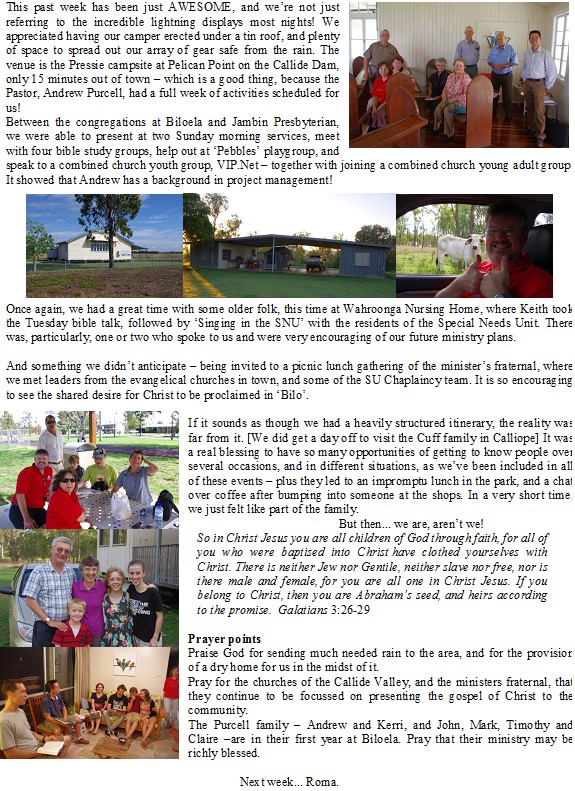 The remaining weeks of October saw us in the Burdekin area, fellowshipping at Home Hill and Ayr. There is certainly a degree of intimacy in smaller congregations, and the warmth of the welcome was a blessing. Elspeth has been invited back to a meeting with church women – though one of the Home Hill elders suggested he may happen to turn up – in the home of a dear couple who hosted her during a teaching placement in 2007. Further reunions followed, meeting up with Andrew and Simone Richardson, who have joined the team ministering to the church in Cairns. Some of our ‘blog followers’ will remember their time in Townsville in the late nineties… though they now have three sons. What an amazing church! We walked in as the Bhutanese service was closing, and the English speaking morning service was followed by Cook Islanders, Samoan, and Korean / Japanese services. If ever there was an effective earthly picture of “every nation, tribe, people and language” worshipping in Revelation 7, you’ll find it in Cairns Presbyterian. A number of folk took Partnership cards, and many showed interest in what we had to share. Had a great time with St Andrews Presbyterian in Townsville, participating in the service, with a significant group staying for a presentation afterwards. Some keen questioning followed, with evident interest in our PNG plans. The Barbers hosted us for lunch, where we caught up with some grey-nomad friends from Wauchope, NSW. Finally…. had the opportunity to speak to our home church. Around fifty folk from Willows, together with a number of friends from other churches, enjoyed a light lunch before our presentation. Encouraging to receive a number of prayer partner requests on the day, and several expressions of interest in ongoing support. It has acted as a bit of a springboard to the next four months, which will see us away from our church family for all but two weeks. We’ll update soon with our calendar of church speaking events, as we hit the road on our way to Christmas with family in Toowoomba and northern NSW. Please be praying for our adjustment to absence from close friends, and leaving behind the structures of support and accountability. A trip to Brisbane provided the opportunity to meet with the Queensland Committee of APWM. It was a great encouragement to receive such genuine support, and an unexpected blessing to renew some twenty year old friendships! Everywhere we go, we keep meeting older folk who have served in PNG, and elsewhere, decades ago – and the passion for mission still burns bright and clear. [ wish I had thought to grab a photo] I pray that we may have such passion for decades to come. On the Sunday, we visited our previous church family in Brisbane, and were warmly welcomed. Had we been more prepared, we would have had photos of the two little girls they remember fondly – now 21 and 19 years old. A return visit has been pencilled in for early 2014, with an opportunity to share our ministry plans at a church dinner. God continues to encourage us on this journey, and we are very thankful.